I am fairly new to the forum but I have been following the anti-f35 group for some time now and like most of us on f-16.net I'm constantly reminded of just how close minded and short sighted some people can be. In my humble view the fusion and networking capability of the F 35 is the most impressive and game changing variable in the equation of how future air battles will be fought. The press and public in general don't truly understand the implications of this leap towards 5th gen warfare. Most of the time the press gets caught up in a discussion questioning the validity of "stealth" (i really hate this term) because it misleads the public into thinking that if the f 35 can be detected than the "stealth" has failed. The sensor fusion is what sets the F22 and F35 apart; and is what brings the situational awareness to new levels. I believe this is why the F35 has broken the mold entirely and can't be described by the term fighter. The F 35 is really a fighter, awacs, electronic attack, ground attack platform, and unlike previous multirole jets it can truly do all of these things at a very high level. Stealth is only a contributing factor to why the F35 will do these things well, it is not the end all be all as many aviation commentators seem to think. As we have seen with the Dutch pilots training interoperability between their f-16s and new f-35s, just the presence of one f-35 using the link 16 datalink made the f-16s much more lethal. General Hostage has also repeated this sentiment, that the level of situational awareness provided by the f22 and f35's sensor fusion makes them game changers if they are just present. These two 5th gen platforms don't even have to shoot to contribute greatly to the fight because it will extend the lethality of the 4th gen platforms and keep them relevant into the 2020's. I have also listened to Billy Flynn (lockheed test pilot) say that even if the f-35's sensors were not as great, the fusion software would still make for a better picture of the combat zone compared to 4th gen fighters. Fusion not only makes for better situational awareness but completely controls radar emissions. Just like the F22, a stealth jet isn't so stealth if its blaring radar signals all over the sky. Fusion is able to fix this problem by only using just the right amount of power to find the range of a target while minimizing the chance that the signal is detected. This is why you can't just put the apg 81 in a Su-35s and say that now the Sukhoi is better. Not only are the russians far behind in the realm of individual sensors but they also have not shown the ability to produce a aircraft with the same level of fusion as the American 5th gen platforms. Is there anything I'm not understanding correctly about fusion? It's also the one single thing that cannot be retrofitted to a 4th gen asset. APA are full of misleading information anyway , so why bother? IMO, sensor fusion along with networking (they go hand in hand) greatly improve the situational awareness of F-35s over any existing fighter aircraft. Especially a group of F-35s will have far better SA than a group of any other fighter aircraft. On the other hand the very low RCS of F-35 significantly lowers the SA of the enemy. They won't see any F-35s most of the time when other fighters (save F-22) are easily tracked. Together they improve the combat effectiveness enormously. I don't think you can retrofit 4th gen fighters with F-35 level sensors and sensor fusion without completely rebuilding the airframes and designing basically a new aircraft. Theoretically it's possible, but I doubt anybody will spend the money to do that as it would be very expensive..
hornetfinn wrote: I don't think you can retrofit 4th gen fighters with F-35 level sensors and sensor fusion without completely rebuilding the airframes and designing basically a new aircraft. Theoretically it's possible, but I doubt anybody will spend the money to do that as it would be very expensive..
F/A-18E/F Block III ASH (Advanced Super Hornet) is an example. F-35 style cockpit, internal EOFLIR, EODAS type system, AESA radar, I doubt it has a Barracuda analog though. Never saw an actual price for that though. Which is the real issue. 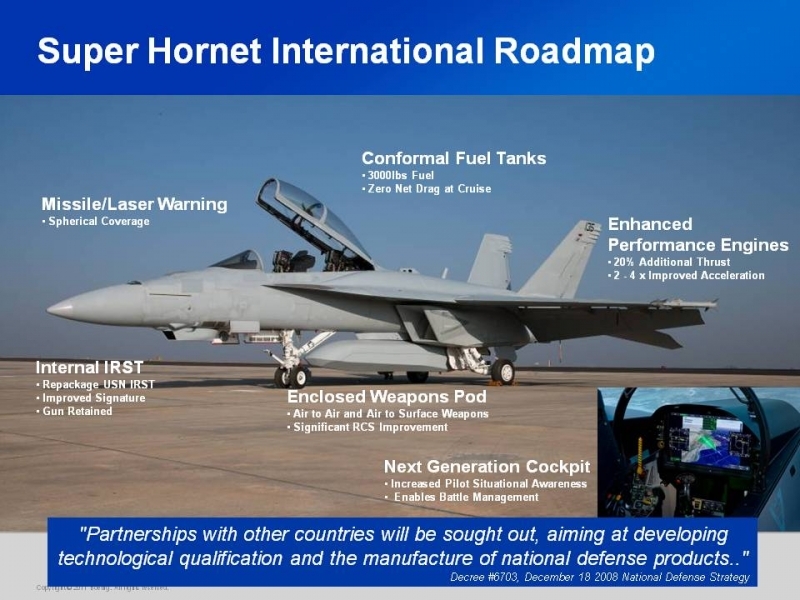 If the government would just hand the tech over to say Eurofighter or F-18 and say here have it for free you would still have a billion, very conservatively, in R&D cost. Your fielding cost would probably broadly in line with the F-35. So in the end no one will bother. That is kind of the key for all of this. Yes you could do a lot of these things. But it may well be cheaper to simply buy more F-35's than mess with this. I think the current F-15 program is about as extensive of these kind of programs one is going to see. Interest in doing these things is going to crater over the next few years. bigjku wrote: I think the current F-15 program is about as extensive of these kind of programs one is going to see. Last edited by hb_pencil on 02 Feb 2016, 20:39, edited 1 time in total. btw, the ASH does not have EODAS-like sensors. It barely has a MAWS. I could have sworn that I had read an article whose exterior pictures included several glass windows. I can't find any pictures now to support it so I will chalk it up to seeing/remembering something wrong. Sorry. That was them finally adding an IR MAWS to the SH. btw, That "internal IRST" is just that, only an A2A IRST. SpudmanWP wrote: btw, the ASH does not have EODAS-like sensors. It barely has a MAWS. Not that you would care to keep up with this, but any info on the General Dynamics Advanced Information Systems, Type 4 Advanced Mission Computer for the SBug? I know the Navy and Boeing tested it, certified it and had it pending for the future SBugs. I can find no appropriations, contracts or "Approvals" for the Type 4 in the pending SBug purchases. Do you think this will happen in this "last" batch of SBugs (ASH?)? Have not heard anything recent about it.